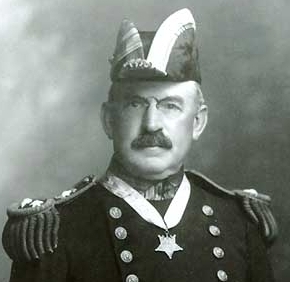 Admiral Frank Friday Fletcher (November 23, 1855-November 28, 1928) was an American naval officer of the late 19th and early 20th centuries. 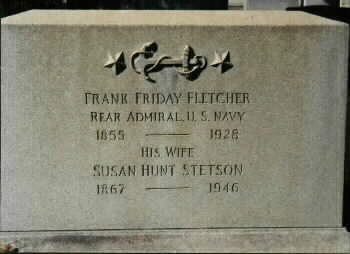 He was the uncle of World War II Admiral Frank Jack Fletcher. Fletcher, born in Oskaloosa, Iowa, was a member of the U.S. Naval Academy class of 1875. 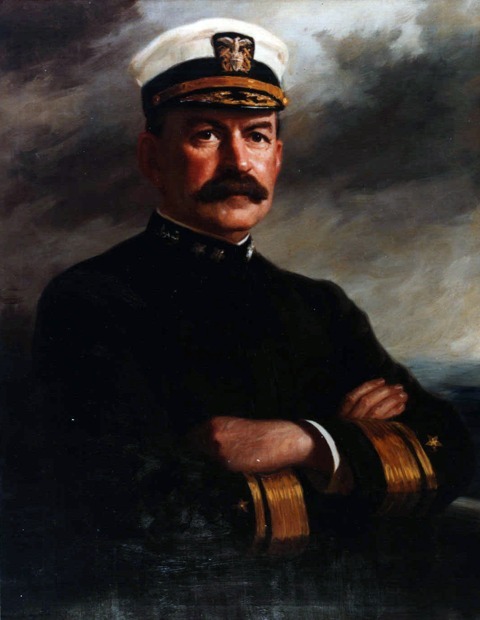 As Commander of the 1st Division, Atlantic Fleet, he directed the landing at Veracruz, Veracruz, Mexico, 21 and 22 April 1914, with distinction for which he received the Medal of Honor. He was named Commander-in-Chief of the Atlantic Fleet later that year, ranking as Admiral from 10 March 1915 until completing his assignment in 1916. He served on the General Board until retiring on 23 November 1919, earning the Distinguished Service Medal for his meritorious service during World War I. Twice recalled for temporary active duty, he served in 1925 on a board studying the most effective use of aircraft in national defense. 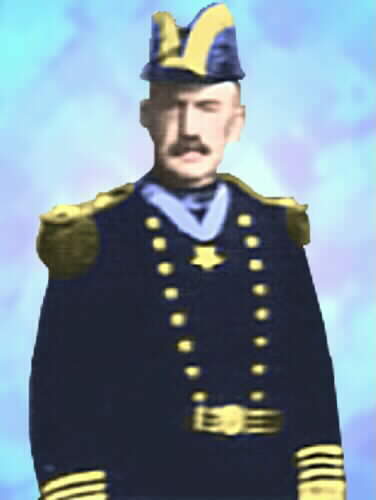 Admiral Fletcher died in New York City on 28 November 1928. The USS Fletcher (DD-445) was named for Admiral Frank F. Fletcher. 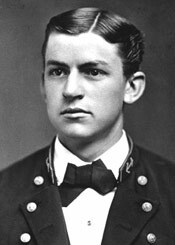 Born on November 23, 1855 at Oskaloosa, Iowa, he graduated from the United States Naval Academy in 1875. After his first cruise on the USS Tuscarora, he was commissioned an Ensign in 1876. Routine duties occupied the next several years, highlighted by a world cruise on USS Ticonderoga under Commodore Robert Wilson Shufeldt in 1878. In 1887 he was assigned to the Bureau of Ordnance over the next six years, he made numerous contributions to gun mechanisms and gunnery practice, notably the Fletcher breech mechanism that increased the speed of rapid-fire guns. In 1890 the Navy adopted his suggestion for the use of range lights on all vessels. He developed the first doctrines for torpedo warfare while commanding the torpedo boat Cushing in 1893 and in 1896 was assigned to the battleship USS Maine, but was absent when the ship was blown up in Havana Harbor, triggering the Spanish-American War, in February 1898. Alternate shore and ship duties followed, including ordnance work, command of the Torpedo Station at Newport, Rhode Island, and a year on the General Board of the Navy. In 1910, he was appointed an aide to the Secretary of the Navy. In October 1911 he was promoted to Rear Admiral and until 1913 commanded divisions of the Atlantic Fleet. In February 1913 he was named commander of U.S. Naval Forces on the East Coast of Mexico, during a period of high tension between the U.S. and Mexico marked by a refusal by President Woodrow Wilson to recognize the government of General Victoriano Huerta. On April 9, 1914, Mexican authorities at Tampico arrested a boat crew from the USS Dolphin and refused Admiral Henry T. Mayo's demand for a 21-gun salute to the American flag accompanying an apology. After consultation with Congress, President Wilson ordered Fletcher on April 21 to seize the Customshouse at Vera Cruz. He landed a regiment of Marines under the command of Colonel Wendell Cushing Neville, reinforced by Seamen to a total of 787 men. More Seamen and Marines were landed later in the day and on the next day as Mexican resistance proved quite stubborn, but by noon on April 22 the entire city had been occupied. He turned command of the city over to General Frederick Funston on April 30. For his part in the Vera Cruz operations he was later awarded the Medal of Honor. In September 1914 he was named commander of the Atlantic Fleet, receiving promotion to Full Admiral in March 1915. He returned to shore duty in June 1916 and during World War I served on the Navy General Board and on the War Industries Board. He retired in November 1919 and died in New York City on November 28, 1928. He was buried in Section 3 of Arlington National Cemetery. 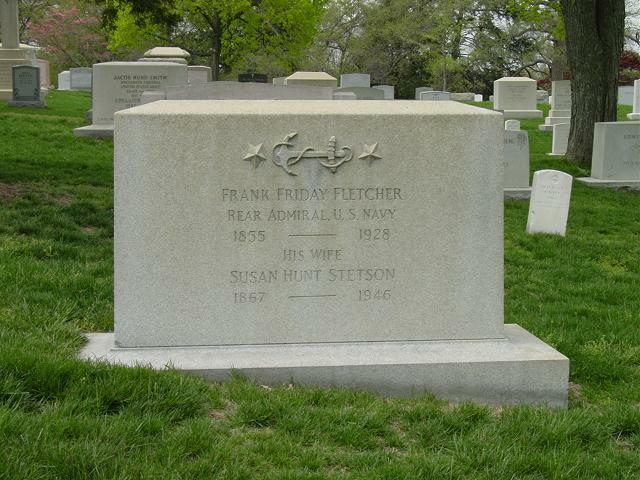 His wife, Susan Hunt Stetson Fletcher (1867-1946), is buried with him. Rank and organization: Rear Admiral, U.S. Navy. Born: 23 November 1855, Oskaloosa, lowa. Accredited to: lowa. G.O. No. : 177, 4 December 1915. Citation: For distinguished conduct in battle, engagements of Vera Cruz, 21 and 22 April 1914. Under fire, Rear Adm. Fletcher was eminent and conspicuous in the performance of his duties; was senior officer present at Vera Cruz, and the landing and the operations of the landing force were carried out under his orders and directions. In connection with these operations, he was at times on shore and under fire.